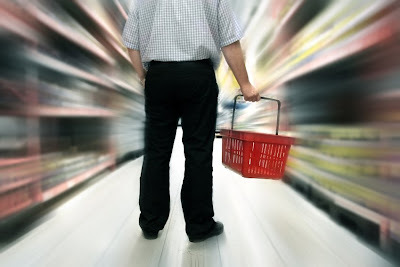 If you are anything like me, grocery shopping with your hubby can be a mental health hazard! It begins by you asking him to go grab a can of cream of chicken soup that you forgot. ....He comes back 10 minutes later empty-handed. It continues by you specifically detailing which kind of crackers you want. ....He returns with the wrong kind of crackers, a bag of chips, oreos, and a piece of raw steak. It ends by you saying..."Go to the car. I'll be out in a minute." I think men must have blurred vision in the store, but the vision breaks as soon as they see junk food. Perhaps this isn't the case for your husband. If not, congratulations! But, if this sounds like your man, read on ladies...I have a solution! When you go to the store together, take with you three or more little cards in your purse. On each one, write something creative that will motivate your husband to help you and not complain about being at the store. - Get me some green chiles and a 5-minute back rub is all yours tonight! - Guess what I'm not wearing? You can find out later if you get me six apples. - Get yourself some salsa so that we can fiesta tonight! While your shopping, slip him these cards. He'll be pleasantly surprised and you'll find that the shopping gets done faster. No more blurred vision and "magically" he'll be able to find EXACTLY what you've asked for. Amazing. What would you write on one of these cards? Love this idea! Below are some of my ideas. Get a box of Frosted Flakes and I will make tonight GRRRR-eat! Get a gallon of milk and tonight you can watch a MOO-vie of your choice. Orange you going to be happy after I'm done with you tonight. Get 5 oranges and I will wear something special tonight.